Welcome to SitcomsOnline Digest! This week, we're hearing about NBC's next live musical, we're learning that ABC is cancelling one of their daytime series, and we're hearing about the release of the first season of a very popular sitcom from the 90s TGIF lineup on ABC. In addition, it's a holiday weekend, so we've got plenty of marathons to enjoy on TV. Let's get going! We've already had one big story that has likely been missed by many due to the demise of TVShowsOnDVD.com, and that is Warner Archive will be releasing Step by Step - The Complete First Season on June 12. 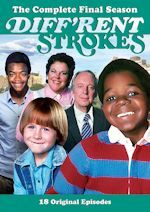 Different Strokes - The Complete Final Season (DVD, $22.97): Oddly enough, with the demise of TVShowsOnDVD.com being this past week, one of our favorite sitcoms around here will be wrapping up on DVD this week. SundanceTV is celebrating the Memorial Day weekend with a marathon of M*A*S*H that doesn't end until Monday night. The Streets of San Francisco is this weekend's binge on Decades. MeTV begins a new lineup on Monday, which will feature new additions The Jeffersons and Charlie's Angels. Nash Bridges is coming to H&I, and it all begins with a 14 hour marathon on Monday. Arrested Development returns for a fifth season on Netflix on Thursday. Also on Netflix this week, on Friday, Unbreakable Kimmy Schmidt returns for a fourth season.